Rely on our professionals to create a customized dog obedience training program to teach your dog appropriate behaviors. If you are dealing with a hyper animal or can’t deal with your dog’s behavior on a leash, we can help. It takes time and patience to create a bond with your dog. The most effective and efficient way to create a bond between a pet and its master is through our dog obedience classes. The Orlando Dog Wizard teaches your dog the right way to behave as a member of the family. Dogs cannot understand their masters unless the commands they are given are consistent and clear. A dog obedience trainer on our team will work with you to help your pet learn all of the right commands and behaviors involving people, social situations, and proper interaction with other animals. 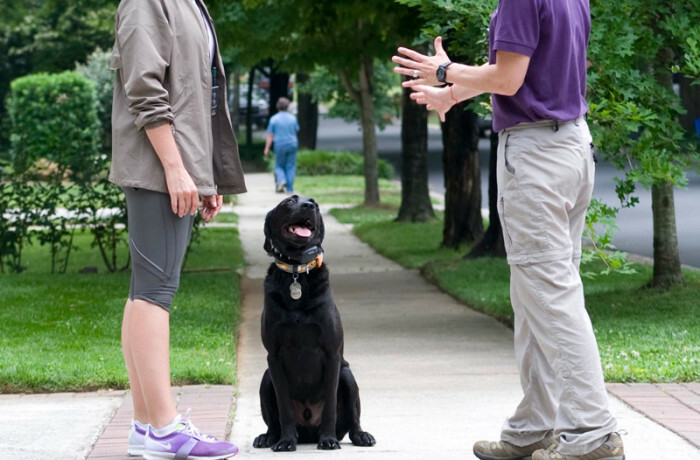 Expect transformative dog obedience training in Orlando, FL, and the surrounding areas. While teaching your dog fun commands like high-five or shake is a great way to show children and neighbors that your dog is trustworthy, dog behavior class influences your pet for a lifetime. Learning the right commands from a respected dog behavior trainer can save your dog from a dangerous situation. Knowing the command “come” is not just for show; its true test is when your dog must respond because it is in danger. For example, your dog may be off the leash in your front yard and a neighbor walks by with an aggressive dog. In this case, your dog can be kept safe from harm by following your “come” command when called. An obedient dog trusts the judgment of its master and will respond to a command in every situation, including those involving serious distractions. A few classes with our dog obedience trainer can transform your dog’s behavior.